“You should visit Bergamo sometimes, you’d love it here,” Omar, a guy a befriended during my first trip to Argentina and who lives there, had been insisting for the last 4 years. I had heard that Bergamo, a small city in the north of Italy, was pretty. My parents have been there years ago, and told me they enjoyed it. I did want to visit Bergamo, but one thing or another always kept me from actually doing it. There are more popular destinations, more exotic places, and… well, I just didn’t know much about the area and hardly made any effort to look for more information. Then, I decided it was time to be more resolute. I would visit Bergamo, because after all I can’t possibly be traveling all over the world and miss out on what there is too see right in my backyard. 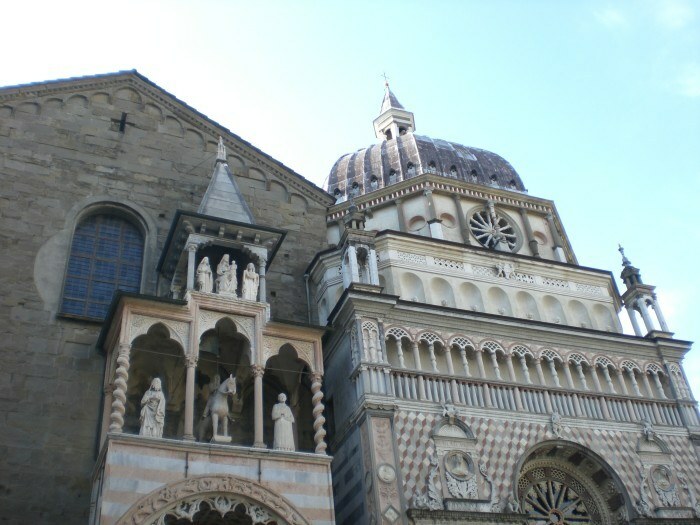 Omar swore to me that there are many things to do in Bergamo, and that I would enjoy it. In a post I wrote back in 2016 I had a resolution, saying that I would visit Bergamo. I thought back then that if I said out loud, if I put it out there for the world to see, I would have to stick to my words and just go or lose my credibility altogether. I always keep my promises. Thus, I finally went, finally decided to figure out whether is Bergamo worth visiting. The minute I arrived, I realized I would be falling in love with it, and that Omar was right: there are many more things to do in Bergamo than what I had expected. “Why have I been waiting for so long to visit?” I asked myself when I got the first glimpse of Bergamo Alta, the Old Town. I ended up spending 3 full days in the area – each of them packed with activities – and I truly enjoyed it. After going, I can confirm that Bergamo is great for a short break and even for a longer vacation. To those who wonder “is Bergamo worth visiting?” I answer with a firm “yes!” It is a fantastic alternative to more famous destinations in the region, like Milan (which by the way is suitable even for budget travelers, as there are a bunch of things to do in Milan for free), Lake Como and Lake Garda, and has retained all of its original charme. The range and quality of attractions in the area is so good that it is impossible not to fall in love with it. What is it about Bergamo that made me like it so much? I could just say “everything,” but that would be too reductive and would not do it justice. So, here’s a few things to do in Bergamo that will make any traveler want to visit and stop wondering whether is Bergamo worth visiting. Bergamo has a very interesting history, which is reflected in its architecture, and one of the nicest things to do in Bergamo is learning about it. Much of its architectural splendor and artistic inspiration are due to the influence of Venice, which ruled it between the 15th and the late 18th century. Bergamo provided as a defense point for Venice, hence the walls that are built around it and which are under examination by UNESCO to be included in its World Heritage Sites. The town is divided in two distinct parts: Bergamo Alta, on the hill, is the cluster of gorgeous medieval and renaissance buildings; and Bergamo Bassa below. Those who visit Bergamo should not miss the jewel of Bergamo Alta, Piazza Vecchia, where the 12th century Torre del Comune is located. Even nowadays, every night at 10 pm its bell rings 100 times to announce the curfew and the closing of the city gates. Also located on Piazza Vecchia is the 16th century Biblioteca Civica and the 12th century Palazzo della Regione. The archway of the Palazzo della Regione leads to the gorgeous Piazza Duomo, with its neo-classical Duomo and the beautifully decorated Cappella Colleoni, a real renaissance masterpiece built in 1487 to house the tomb of political leader Bartolomeo Colleoni. Tip: the Bergamo Card gives 48 hours access to public transportation and museums, as well as discounts on shopping. It can be bought online for just € 15,00. One of the things I enjoy the most when I visit a new place is walking around, almost aimlessly, taking in the atmosphere and the views. I find there is something special about cities on the hills and Bergamo is one of them. The view of Bergamo Bassa from Bergamo Alta is gorgeous, even more so the view from the Campanone tower and from the Torrione della Rocca. One of the nicest things to do in Bergamo is exploring the city on foot. The funicular that goes from Bergamo Bassa to Bergamo Alta is also a good way to take in the views of the city. Taking the funicular is what to do in Bergamo on a cold winter day, when the weather isn’t good. Bergamo Alta at night is beautiful – the tiny alleys perfect for a stroll, as they are closed to traffic. I particularly liked walking from Bergamo Alta to Bergamo Bassa along the walls, crossing small streets, going through the city gates. Come to think of it, it can be quite romantic! Taking a night stroll along the walls is one of the nicest things to do in Bergamo. Bergamo surroundings are very interesting. Picturesque villages, medieval castles, countryside, lakes and mountains – there literally is something for anybody. Since getting out of the city is so easy, I would say that those who visit Bergamo ought to explore the surroundings. 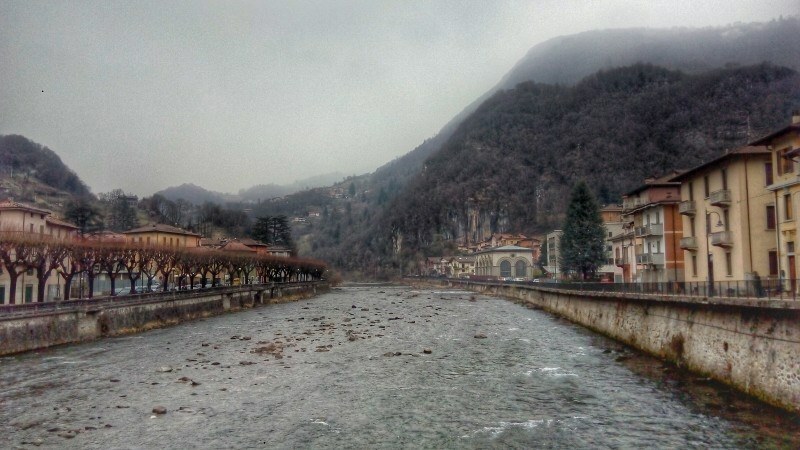 If getting out of the city is what to do in Bergamo, one of the places I truly recommend visiting is Crespi d’Adda, a tiny village in the municipality of Capriate San Gervasio that now counts no more than 600 inhabitants. 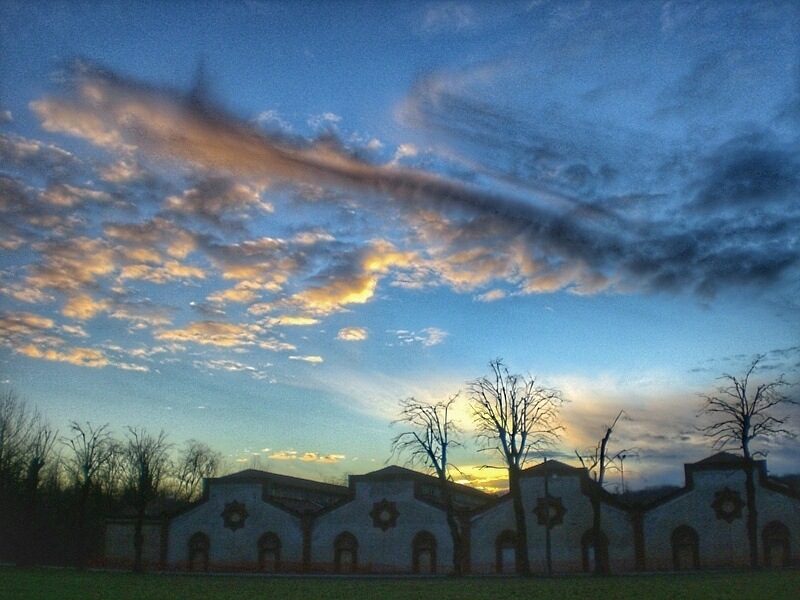 At about 20 minutes drive from Bergamo, Crespi d’Adda is a UNESCO World Heritage Site and a great example of the 19th and 20th century “company towns” which were built in Europe and North America by industrialists in order to meet the workers’ needs. The entire village is built around a cotton mill (the factory stopped working in 2004). There was a school, a theatre, a church, a cemetery and a wash-house and houses were built following the model of English architecture. It is a great place to visit, especially for those who enjoy getting off the beaten path, and worth going to for those visiting Bergamo. 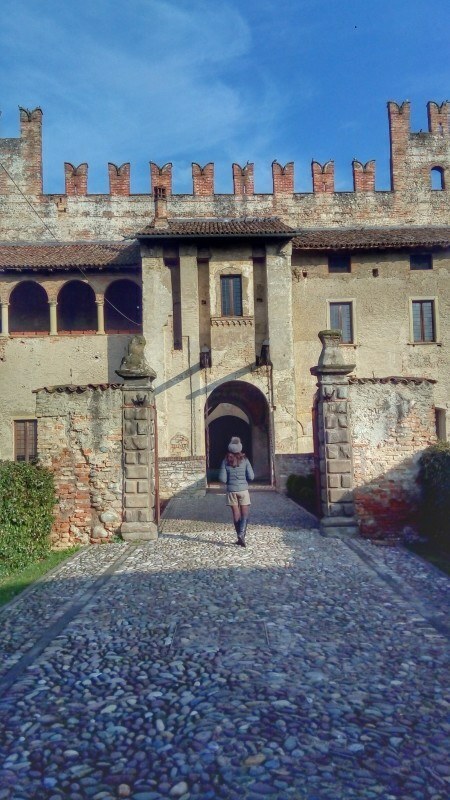 If getting thrown back in history is one of the nicest things to do in Bergamo, then my favorite place to do so around Bergamo is the Castello di Malpaga. 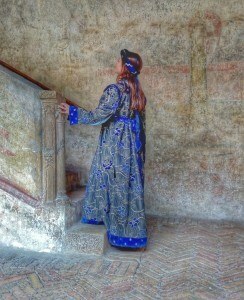 I love history, but the way the visit of Castello di Malpaga is conducted is such that I would gladly recommend it to families with children too. Malpaga is a 15th century castle which used to have defensive functions. It was built under orders of Bartolomeo Colleoni, who ruled the area and lived there with his wife and a number of daughters. The rooms are painted by Il Romanino – the most precious frescoes are in what used to be Colleoni’s bedroom. Time to act like a princess! 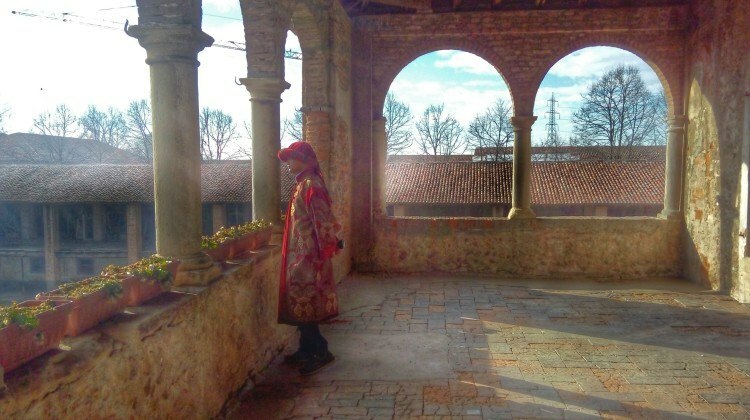 Aside from the gorgeous setting, what makes the visit of Castello di Malpaga particularly interesting and fun for those who visit Bergamo is that upon arriving visitors are invited to change into 15th centuries attires and then roam the castle wearing those dresses. There is a good selection of dresses. They are all made according to the style that was in fashion in the 15th century and thus all very heavy to walk around in. I certainly didn’t want to miss on that. I think we all looked splendid in them. The most hilarious moment was a stolen picture of us, all wearing the dresses and all staring at our smart phones. Call it back to the future! Should I declare war on Milan? 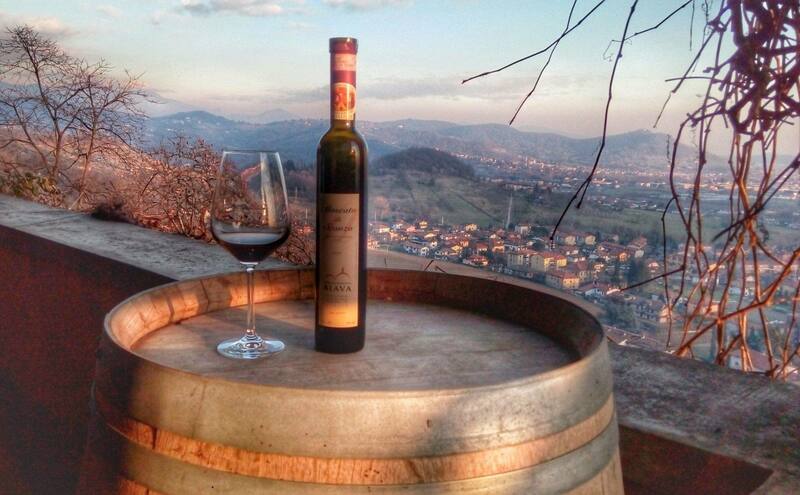 Among the things to do in Bergamo there’s trying the local wines. I certainly appreciate wine (I have traveled all the way to Stellenbosch, in South Africa, just for that!) so I was very happy to visit Scanzo, whose moscato wine has been included in a list of selected Italian DOCG wines (strictly protected). Moscato di Scanzo is typically a meditation wine, very thick, rich and fruity in flavor and thus it is not meant to accompany food. I have had the pleasure to tour one of the vineyards (Azienda Agricola Biava) where it is produced – only the best grapes are picked and the production process lasts a minimum of two years. And at the end of the tour, I could try the wine enjoying an incredible view. Anybody visiting Bergamo who enjoys wine and nature should visit! Bergamo surroundings are perfect for nature lovers and those who ask “is Bergamo worth visiting?” should consider the incredible nature surrounding it! The city has easy access to mountains and great skiing and hiking trails. I had no time to go for a hike (plus it was really cold when I visited) but I managed to squeeze in a visit to Lago di Endine. Set between tall peaks, the lake is now a protected area due to its remarkable environmental interest. It is a perfect place for water sports such as kayaking, as well as sailing, windsurfing and canoeing. The east bank of the lake is lined with a few charming villages. Sitting in one of the outdoor pools when it is cold and gloomy outside is truly atmospheric. 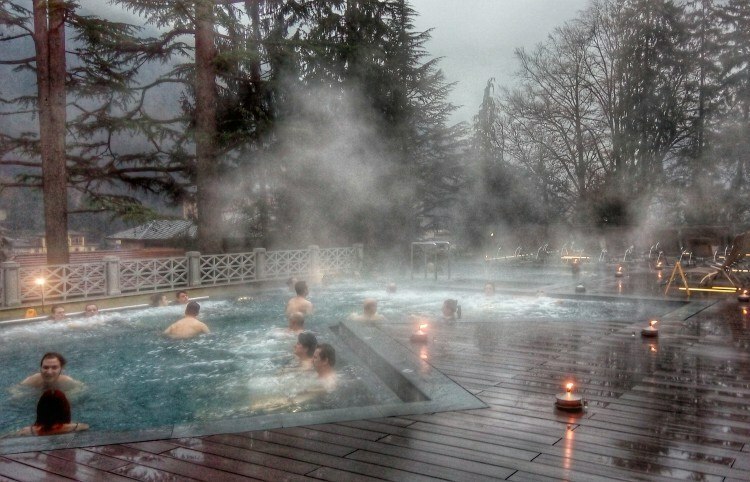 The spa has an incredible amount of rooms and activities, including a music and color pool (where it is possible to listen to music under water); various kinds of saunas; aromatherapy rooms. Guests can also enjoy an aperitivo dinner – a buffet of Italian appetizers and prosecco wine. It is quite amusing to sit in such an elegant environment, sip some great wine and eat delicious food, when everybody is wearing a white bathrobe! It’s definitely one of the nicest things to do in Bergamo. Food in Italy is very regional, so I wasn’t sure what to expect in Bergamo. All I knew about Bergamo before going is that it is where 9 very well known Italian cheeses – such as taleggio and stracchino, which I love – are produced. I was honestly impressed with the food in Bergamo – and coming from a really picky eater that is hardly a foodie, this should not go unnoticed. Everything I had was mouthwatering, to say the least. I can now wholeheartedly say that one of the nicest things to do in Bergamo is eating. Everything I tried was made with only fresh, local ingredients. One of my favorite dishes has been casoncelli, a ravioli kind of pasta which is filled with (among other ingredients) salami and pork meat and served with a sauce made of butter and bacon. Not exactly light, but oh so tasty and definitely worth a run to burn the calories afterwards. I also loved the various kinds of polenta, cornmeal cooked till firm and served with a variety other ingredients, such as mushrooms. It’s a dish that those who visit Bergamo should definitely try. Can you believe I actually prepared this? 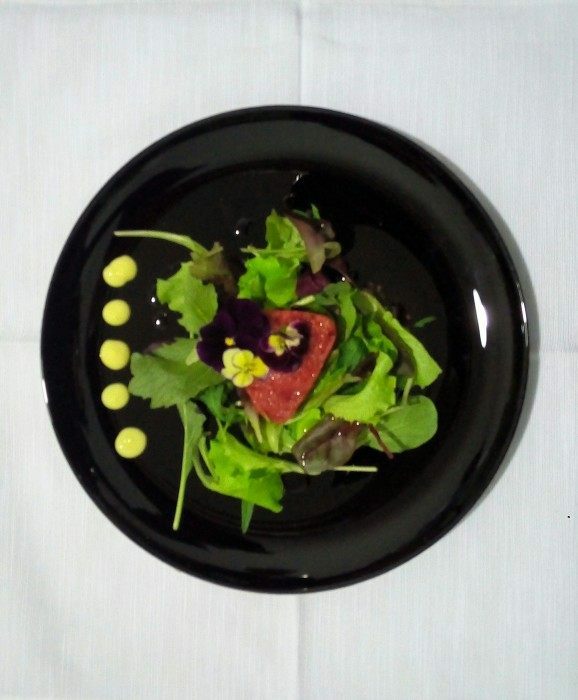 Among the top things to do in Bergamo, there’s taking a cooking class. Actually preparing a meal is a great way to appreciate regional food in Bergamo. Together with 3 other persons, I enrolled in a cooking course with Food Lab 3.0 and in 3 hours we prepared a fabulous 3 courses meal which consisted of a steak tartare appetizer, a main course of pumpkin ravioli (seriously the best ravioli I have ever had) and a lovely tiramisù dessert. We got to eat our food in a gorgeous setting, accompanied with great wine too. Carlo, our teacher, showed us how to prepare fresh egg pasta; he unveiled the secrets to a good tiramisù cream and how to chop the meat that goes into the steak tartare, as well as how to decorate a dish. We also discussed the importance of using local, good quality and organic ingredients. Using local ingredients is definitely what to do in Bergamo. Bergamo is also packed with lovely restaurants, and those who visit Bergamo should not miss out on the chance to try the delicious food. Giopi e Margi offers fantastic local traditional (and revisited) cuisine in a cozy setting and with a great selection of wines. Caffé della Funicolare, in the Old Town of Bergamo Alta, has great daily dishes (such as casoncelli or involtini, a meat roll served with cabbage) and a fantastic view over the New Town. Those who are visiting Bergamo on more of a budget should try Cantiere Cucina, a tiny family style restaurant in Borgo Santa Caterina, in the New Town, and offers some of the staples of local cuisine as well as other dishes, in a very relaxed atmosphere. Ristorante da Mimmo, in Bergamo Alta, takes pizza to a whole new level: the quality of ingredients used for the toppings, the perfectly raised pizza dough, the choice of artesanal beers, the incredible desserts, the nice setting, the elegant yet relaxed environment and the great service make it a great place to have dinner. I don’t mind touristy places. In fact, I usually get carried away by the beauty of a place to the point that I don’t even notice the presence of other people around me – much to the amusement of “real” backpackers who make it a point to get off the beaten path. Having said so, I do enjoy places that are outside of the typical tourist routes. 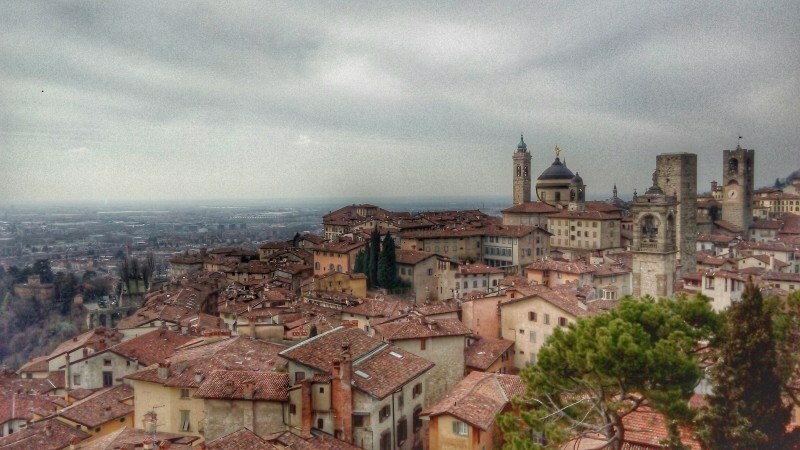 Those who visit Bergamo can easily see that the city is still not overcrowded with tourists. Although it is incredibly beautiful, Bergamo retains its original character, and it is pleasant to walk around a city where the majority of people are locals, where life goes by as usual, undisturbed by the presence of only very small groups of tourists. In such a setting, it is really easy to meet the locals, who are actually very friendly and welcoming – it’s one of the nicest things to do in Bergamo. I predict that this won’t last very long: such a charming city is bound to get under the radar of tourists soon, especially as it is very easily accessible, and more and more people will want to visit Bergamo. But I am confident that Bergamo will keep its character and charme. As I have already said, Bergamo is very easy to reach and those who want to visit Bergamo won’t have a hard time getting there. At a stone’s throw from Milan, Bergamo Orio al Serio airport has become one of the most important European hubs for budget airlines. This means that it is really cheap to get there from pretty much all over Europe (and beyond). In fact, so easy and cheap that I could really find no excuse to postpone my visit any longer. One-way BGY airport private transfer. However, do watch out with the added costs of budget airlines if you plan to use this mode of transport when you visit Bergamo. The flights may be dirt cheap but at times the arrival times are such that passengers are forced to spend a night in a (not so budget friendly) hotel near the airport. Gemma and Craig learned this at their expenses when they had a not so cheap layover in Bergamo, which added to their backpacking Europe costs. Relais San Lorenzo has fantastic, comfortable room in a stylish setting. Click here for the latest rates and here for reviews. Casa di Charme Monica is a fabulous apartment in Bergamo Alta. Click here for the latest rates and here for reviews. Petite Suite is a beautiful hotel in lower Bergamo. Click here for the latest rates and here for reviews. Have you ever been to Bergamo? What did you enjoy the most there? Legal Disclaimer: This article was written in partnership with the Explora S. C. p. A. and In Lombardia as part of the #inLOMBARDIA365 campaign. All the views and opinions expressed are my own and based on my personal experience. The views expressed are honest and factual without any bias.